Uncategories Are the BC Liberals ahead? Yesterday we got two new polls and we can indeed wonder if the BC Liberals aren't now ahead. The first one, in the morning, was from Angus-Reid. It seems the long time pollster finally decided to enter the BC election. Notice the convenient timing: early enough that if the poll is wrong, they can say that people changed their mind at the end, but late enough that they can claim victory if they were right. This poll confirmed my suspicion that this is essentially a tied race with the BC Liberals at 40% and the BC NDP at 41%. This is after redistributing proportionally 19% of undecided. Remember that doing so means you either assume that all the undecided will ultimately not vote (a very strong assumption) or that they will all ultimately vote like the decided and leaning (another strong assumption. After all, it'd mean decided and undecided are the same). If you assume on the other hand that undecided have a tendency to vote a little bit more for the safe incumbent instead, then the BC Liberals are likely ahead. This poll has some interesting questions. In particular, you see that a plurality of voters still think Christy Clark would do a better Premier. Maybe more important, a plurality also believe that the BC Liberals would be able to provide the best overall government. This is despite Clark being less popular than Horgan and despite the BC NDP's policies being preferred. If there is a "surprise" on Tuesday, please remember this question. Then we got the first poll from Innovative Research. Actually three polls but all published at once in multiple pdf, including one with 101 pages (it's not a typo!). Innovative uses online panels as well as live-interviewers phone poll (something rare in Canada nowadays). So I was pretty excited to get this poll. Except that for some reason, Innovative still includes the BC Conservatives and they have this party at 7%! This pretty much invalidates the rest of the poll (the pdf is still full of useful info though) and I can't really do anything with it. Assuming we believe the numbers, the Liberals are ahead 34 to 31, with 9% of undecided. According to the second choices of the BC Cons voters, they favour the Liberals at 33% versus 22% for the BC NDP. Thus, if we redistribute the BC Cons votes, we get the BC Liberals at 42.5%, the NDP at 37% and the Green at 18%. I have NOT included this poll in my average as it relies on an iffy redistribution of voters who somehow still believe the BC Conservative party exists. With that said, the numbers from Innovative are maybe an indication that the Liberals are underestimated again in the polls. So I'm not included it but it makes me feel more comfortable about my own average putting the Liberals ahead. And yes I have the BC Liberals ahead (and favourite based on the probabilities). Some of you will most likely wonder why I have such different projections from the CBC forecast. To which I would respond two things. First of all, 44 seats to 40 is not that different from 40 to 44, especially once you realize there are many close races. Secondly, it's because I don't allocate undecided proportionally as I mentioned above. Remember that if you hate this assumption and you prefer to use a different one, then you can always use the simulator with your own numbers. While the CBC forecast and my projections aren't too far in terms of seats, they differ totally in terms of probabilities. Oh well, I have full confidence in my simulations as they have proven over time to be very accurate. 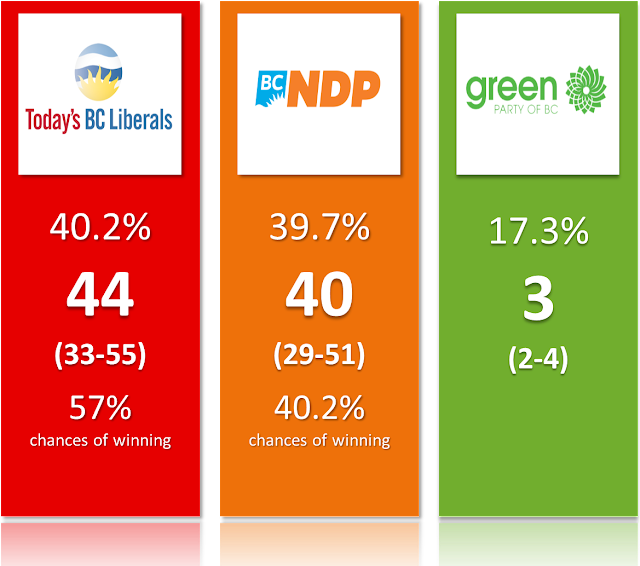 I think pretending the BC NDP has a 72% chances of winning is being delusional. We'll see if the last wave of polls this weekend and until Monday pick up a last minute trend or confirm the one seen this the debate - an increase of the Liberals. I think the probabilities will remain close though, which means that the final projections won't be as assertive as I usually am. Oh well, at least if I'm wrong I'll be able to say that there was a lot of uncertainty. Speaking of uncertainty, here is a list of factors or variables that can introduce error in my forecast: accuracy of the polls, region specific swings, effects of the turnout, the fact the Greens are surging and running more candidates, the fact the BC Conservatives are pretty much non-existent but had multiple ridings above 10% last time, the new electoral map, etc. yes it's a long list. Remember that doing riding-level projections is not the most precise science out there. Please do not have unrealistic expectations. I won't expand too much for this blog post as I'm working hard trying to collect all the social data from the candidates in every riding. And I'll keep my detailed analysis for my final post on Monday. In the meantime, below is the riding-by-riding forecast.